Starting school is tough on the parent too! 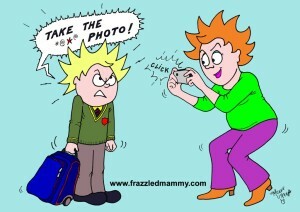 The School Start & taking that photo can be tough on the parent! Damn phone. So much for its in-built camera! Here I am, trying to take a picture for posterity of son’s first day in Secondary school, but for no apparent reason, technology fails me. I’ve lost a batch of photos. Among them were some of his confirmation, 6th class graduation and last day of primary school. I’ll have to rely on my grey matter to remember those moments – picturing the gang of lads fooling around by the church door in their white robes after the confirmation ceremony. “Stand together and smile!” they were ordered as sardonic poses were snapped. On graduation day we parents filed into the ‘halla’ to watch our children sing, perform and receive certificates from the Principal to mark their leaving school. Following further encouraging contributions, the ceremony concluded with a slideshow of the children from early years to their recent 6th class tour. Each student was asked to bring a few photos to be shown onscreen. My 12 year-old wouldn’t tell which ones he’d snuck out. Maybe a cute communion or first day at school shot? A horrific blood scarred Halloween zombie flashed up. “Jesus, of all the flipping photos he could’ve picked. I’ll kill him!” I muttered. At least it got a laugh. The last day of Primary school proved emotional – for some parents, at any rate. “This is it,” I realised, “The end of driving him here and meeting other classmate mothers at the school gate.” That opportunity just doesn’t happen in secondary school. The letter from Post Primary duly arrived outlining the curriculum, calendar and the uniform requirements. Thinking I’d face another meltdown like the day I dragged him shopping for confirmation clothes, I warily suggested we buy the uniform. “Yeah,” he agreed, “So long as we do it all in one shop.” He tried on the shirt, jumper and tracksuit. Chose shoes – even made an effort to knot the tie. No tantrums. With relief I handed over the credit card. Only schoolbag and stationery left to organise. This entry was posted in Parenthood and tagged Cartoonist, Cork, Illustrator, Ireland, Maeve O'Keeffe on September 1, 2014 by frazzledmammy.